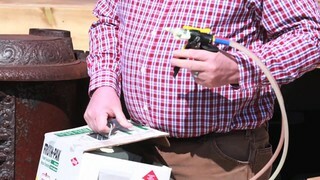 We asked some of our testers to try out the Froth Pak Sealant. Here's what one of them thought. Hi. My name's Ian. I'm here today to show you about the Canadian tire FrothPak Sealant. When you first get the sealant, it comes all coiled up. There's two valves here, one for each tank. What we want to first do, is take your end ... It comes with no end on it, so you can choose this end, which is an injection end. It's simple. You just push it on. This yellow thing snaps down and holds it in place. You can turn these on, and it's just a matter of pulling this trigger and using a sweeping motion. If you're using the blue tip or you can go with just the straight for an injection, if you want to do an injection. I would recommend this product in a commercial application, of anything where you wanted to get that seal. The airtight, watertight seal. It's a very good product for that. For your home use, if you're a window installer, this is a great product to put around the windows if you're coming to do stuff at people's houses.